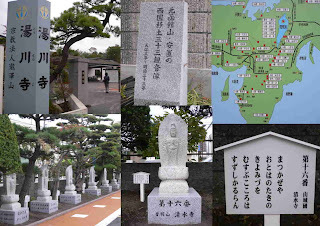 These stone statues representing the 33 Kannon Temples of the Kannon Pilgrimage of Western Japan have been introduced in the Tenpo area (1830 -1843) in the Hakodate mountains above the town. Takadaya Kahei and other rich merchants from Western Japan commissioned their building. They were completed in 1843. During the construction of defence buildings on the mountains during the Meiji period around 1897, these statue had to be removed and were spread out at various places, some to the temple Shomei-Ji 称名寺. 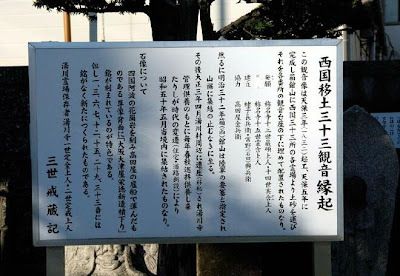 In the Taisho period, in 1928, the first Kannon came to Tosen Village to the Temple Tosen-Ji 湯川寺. 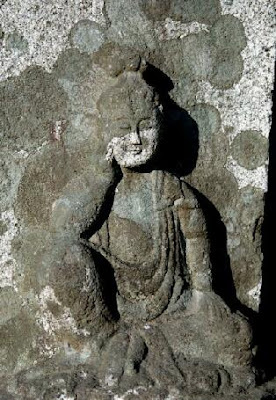 Many old people remember passing a stone Kannon staute on their daily walk to school and talked about being relieved to see these companions of their youth now all assembled in one place. Some statues were in the way of new road and contstruction buildings and were removet to this temple too. 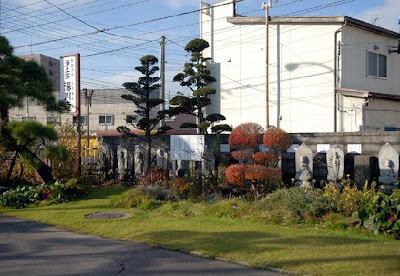 Parishionars of this temple then took three years to visit the original temples in Western Japan and collected a piece of earth from each location. A new walk along the 33 statues was constructed and they were each placed above their own earth now. Only 10 statues are new now, all the others were found and placed in position. A ceremony to celebrate the new "Walk along the 33 Kannon Statues in the earth of Western Japan" was held at the temple in October 2007.